Brown's House is a faithfully restored pressed tin cottage surrounded by a beautiful garden setting and picturesque rolling hills at the historic Boconnoc Park in the heart of the Clare Valley. Guests staying at Brown's House receive a HEARTY COUNTRY BREAKFAST includes provisions of bacon & eggs, sausages & tomatoes, bread, juice, tea and coffee. Whilst staying at Brown's House, you can enjoy the tranquility and history of a large rural property that has remained in the same family since 1905, or explore the wonders of the beautiful Clare Valley. The Clare Valley is Australia’s most famous Reisling producing region, and it also has a rich blend of attractions for all ages including a myriad of wineries and restaurants, art galleries, historic buildings and villages, and picturesque walking and cycling trails. Boconnoc Park is a modern day working farm and has been held in the same family since 1905. Boconnoc Park is still farmed by members of the Brooks family. Currently farming several thousand acres of cropping and running a large flock of Merino sheep producing award winning wool clips. Brown's House is a cottage in the hills just West of Clare. Named fondly after the Brown family who lived there and worked for the Brooks family for many years. Typical of the era Brown's House was one of three pressed tin cottages built on the property in 1910. Brown's has been sensitively and beautifully updated while retaining a wonderful sense of the bye gone era which is associated with historic Boconnoc Park. 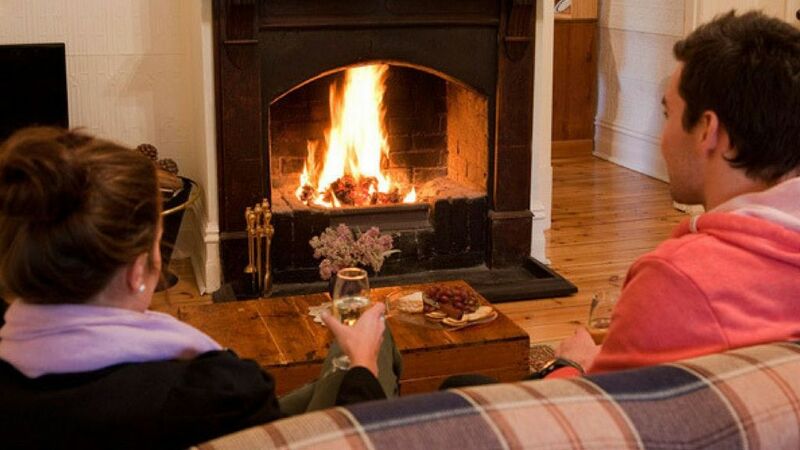 The lounge dining area has a lovely open fire, tartan couches an original dining setting, tv, dvd player. For your interest we have provided lots of historic pictures and information about the cottage and Boconnoc Park. As part of the restoration and upgrade the cottage has been equipped with reverse cycle air conditioning for year round comfort and the spacious country kitchen you will find all the "mod cons" , electric stove, fridge, microwave and quality crockery, cutlery and glassware, table and chairs. Brown's house has 2 generous sized bedrooms, 1 with a king bed (which can be split to 2 king single beds) and the other with a queen bed. A short 10 minute from the Clare township and the myriad of wineries and restaurants which make up the Clare Valley. The Clare valley is renowned for its wonderful wineries, the Riesling Trail, a walking/cycling trail which winds its way from the township of Clare in the North to Auburn in the south, a distance of 27 kms, a strong sense of history, great scenery and attractions. Accompanying the good wine of course are terrific lunch rooms & restaurants, art galleries and antique stores. Heritage towns and friendly country pubs complete with billiard tables and jukeboxes still flourish. The Clare Valley is a pleasant 1 and 1/2 hours meander North of Adelaide, and is on the well worn path to the Flinders ranges. Cycling and walking are well catered for with our famous Riesling Trail. Cycle hire can be arranged. Most wineries are open to the public, and it is here at the tiny wineries you will get the chance to meet the wine maker at cellar door. The valley is host to a myriad of fabulous "eateries" dotted about in vineyards, on top of hills giving you terrific views, adjacent cellar doors and in country pubs and restaurants all using local and regional fare. We also have antique stores and galleries for the avid collectors. Heritage abounds, both Burra & Mintaro are heritage towns and proudly show off local slate and stone to its best advantage. We have wine tours available and well documented walks available. One of the valley "must do's" is the history walk at St Aloysious & Sevenhill Cellars, bookings are essential by ringing Sevenhill Cellars. I am pleased you enjoyed Brown's House. Labrador and Oak the kelpy. Thank you very much for the great review. it was nice to have you & I am pleased you & your family enjoyed the stay the location, the history & the very friendly dogs. We really enjoyed staying at Brown's House. It's a very beautiful location and a lovely house. Sitting on the veranda with a glass of local wine and watching the sunset was perfect. Gail is a great host and made us feel very welcome. We definitely recommend Brown's House. Thanks so much Tanja. I was lovely to have you & your friend at Brown's House recently. Take care. Nice relaxing and peaceful. Thank you, will recommend.